Tonight Sophie and Zaana got me thinking about the impact of your workspace on your work output. I’ve got a nice office now. I had my own office in my last position too. I’ve sure got used to making the most of my space. I spend a lot of time working at becoming the paperless office, however am way off getting there. In my last office a wall between me and a colleague was paper thin. Not on purpose but it turned out to be a great plus, as we got into the habit of calling through the wall to each other. Our roles were unofficially co-managing a branch and without intentional design that office space allowed us to have our own VERY different work styles, alongside great collaborativeness. It was also funny the first time colleagues in a meeting saw you turn to a wall and address a question, and a voice issued an answer from the other side. In my supervisor roles and branch positions I worked in open office plan areas. It was really hard as a supervisor as we didn’t have any office except the Branch Librarian’s so if any of my team were upset, or I had to speak to them about an issue, I had to try and book the office. Nothing made them tense up like being told they have a meeting scheduled in ‘the office’. Also feeds the gossip that is rife in many libraries. So I would have to say that if you are going to have an openplan space – I think you need HEAPS of little collaborative spaces. 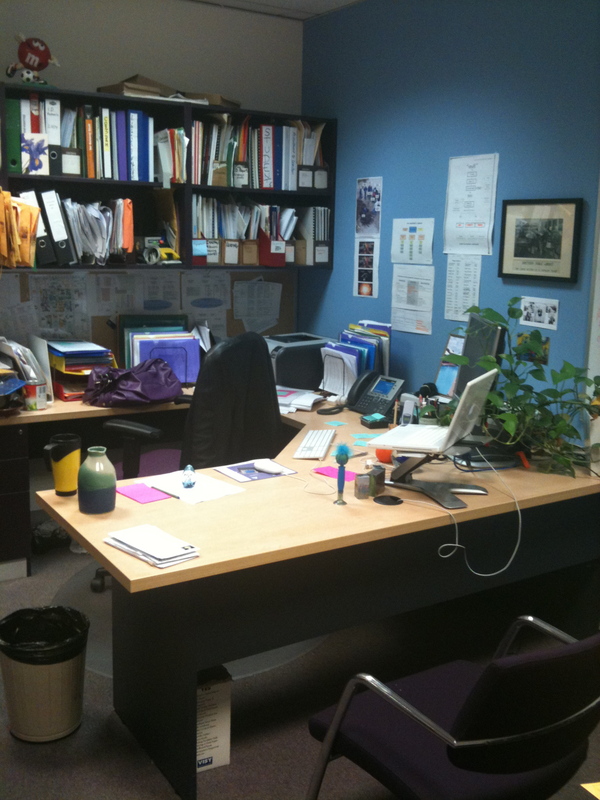 Zaana shows pictures of cute breakout spaces in her post about office spaces. They really need to be so close to the work areas, that you can slip into them without breaking conversation flow or making a big deal of it. Also noise must be contained so louder conversations don’t disrupt those working close by. This applies to public spaces too – eg a space for fine disputes to move too. When I got a new space for my staff last year I tried to address this. 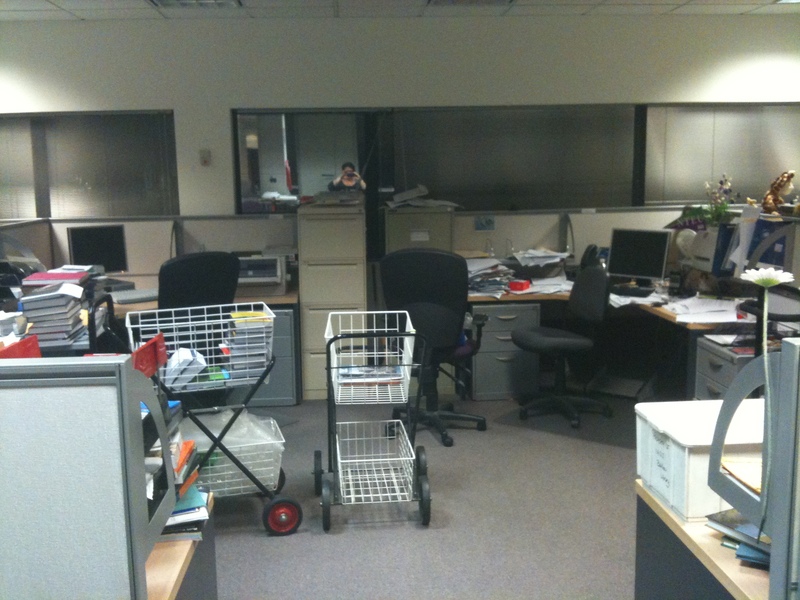 I had 2 staff who had to share a very awkward shaped office. I created a small table and chairs space immediately outside their office. There is already a small meeting room to the right, however it is often in use. I wanted to encourage my staff to have a space they could talk with other staff, without feeling they had to meet quietly at their desks. It hasn’t worked at all. It’s hardly ever used. 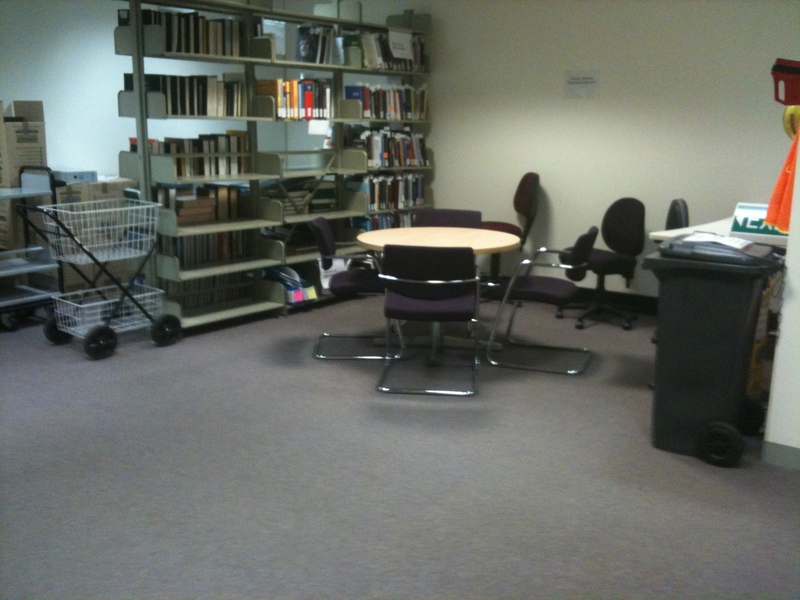 So it’s important to remember that such spaces need some privacy (maybe just for librarians?) and also that often desk chats develop into meetings but by the time you realise it, to get up & move would break up the discussion anyway. Also a power point would reduce the need for the laptop assigned to them to be charged all the time. Similarly I think the fully mobile workspace idea only works if you really can trust your IT infrastructure to allow you to move and have everything at your fingers without breaking your concentration. Now if I got an iPad I might try it, but carrying any sort of laptop around continually can be backbreaking. Several years ago when i had a position that required me to regularly move workspaces Dropbox etc didn’t exist and I had to use a roaming internal network profile that was not reliable. Wifi isn’t enough. You need power, access to paper files (large digitised collection would help here). And whiteboards with coloured pens. 4 years ago we tried mobile desks again at MPOW in a really small way. We were supposed to be working across branches, so on certain days you weren’t in your home branch, you were in another space at a designated ‘hot desk’. The amount of hostility that arose from librarians about not having their own space, their own paperwork, their own ‘stuff’ was fascinating. It was a lot of words that arose from fear of change in my opinion, perhaps fear of not having their own space equalling not having a permanent job. However it does raise the question as to whether you can have this sort of activity based workspace for every personality type. Can some people focus solely on their work if uncomfortable in their environment? Conversely my current office is situated in the middle of a big open plan floor, with a few other offices, allocated to staff who manage sections. It houses cataloguing and library systems staff, trying to get on with their work. There’s therefore a higher percentage of people who prefer ‘quiet’ than I have ever had before. And I’m not quiet. I find it has changed my work output. I’m doing a lot of online searching for the interaction I used to get working in a busy servicedesk area. It’s changed my satisfaction with my job, my confidence in working as part of a team that is moving forward together, and it’s sure increased the number of times my staff have to talk to me on any given day if they work on my floor. As for the Google extras, I think it’s great to have services that encourage teams to work together, or a space to vent your frustrations and clear your head. I’ve started taking little walks outside since @MissSophieMac and @malbooth mentioned it, and it helps me clear my head and focus on the next required thing. Having something like that closer (out of the elements) would be great. However I would think that having many of these extra resources would lead to an expectation that you will work longer hours, or at least be in the building with your colleagues for longer hours. To eat there, go to the gym there and so on. I think I am only just discovering how hugely important it is to have a life outside work. How your wider network, your other activities allow you a more balanced and successful approach to work priorities, as well as feeding in external ideas and influences to keep creativity alive in the library management space. I think it would be sad to lose that. Had a lovely long post for my last entry. I’m looking forward to continuing my blog, just not as often. What have I learnt ? So what have I learnt from #blogeverydayinjune ? It’s interesting. I thought the most obvious new skill would be learning how to write a blog, seeing as I’d always shied away from this before. And that has been great. However it is hasn’t really entered my thoughts yet, I haven’t got to the point where that was a conscious thing learnt. Instead, as I look over my posts and comments, this blog so far has helped me follow up on my thoughts more. A little discipline perhaps. Pinning down and developing or exploring those thoughts that otherwise would have floated out of my head once I came home and turned on the tv. However when you’re searching for a blog post idea at 11pm they come to the fore again, and demand a little more thought in a non work context. My most obvious theme that has grown so far is about research in the library world. From vague thoughts about including some work related posts, to other’s conversations about speaking in professional forums, to a more conscious exploration of a growing interest in evidence based decision making, reading articles and exploring how to find related research online. My previous job descriptions have allowed me to thrive on a natural inclination to react, to make decisions quickly, to move onward and forward. In a servicedesk role, and managing large teams in such roles, crisis management is daily life. Now as I explore my new management role, I am having to increase my confidence in my own abilities to document, plan and make considered decisions after full evaluation. So it has been wonderful using this blog to develop my own needs. I have had helpful comments, I have received useful critique and I have been given humour to keep me on track. Thanks everyone at #blogeverydayinjune – bloggers and those who sent tweets and posted comments. So, it’s been virtual and it’s been great. Today was a wonderful day, and it is due partly to relaxing, and allowing myself to just go with the flow, and mostly to my wonderful friends. My favourite is Jonesy’s Dairy which supplies me with fresh unhomogenised milk (where the cream is on the top and swirls throughout the milk). So today’s blog post is a quick appreciation for my suburb, and the joys of the inner city. Today I went to my local gym the Brunswick Baths. It’s run by the YMCA and boasts a fabulous outdoor heated 50 m swimming pool as well as gym and aerobic/pilates/yoga classes. I got involved in my local council meetings purely so I could fight to retain that pool, and it worked! I then returned books to our local library – conveniently just across the road from the gym/pool, well stocked and offering fabulous Music in Moreland events live in library spaces, as well as other fabulous community engagement projects such as developing an online local history presence through WikiNorthia. In the afternoon with friends I visited our local environmental park CERES. Apart from a well stocked cafe, musical events and playspace; they offer environmental learning opportunities for all ages, fantastic nursery with events such as learning how to grow fruit trees, and a Bike Shed where you can learn all sorts of bicycle mechanics. I’ve been enjoying discussions we’ve had about creativity in libraries, and am interested in how this can be demonstrated to be of benefit in these more restricted financial times. I remember some years ago a question from management about ‘What would we see as a reward for good work? Outside of money …’. Initial reactions were dismissive, yet as the conversation continued lots of other motivators were identified – respect, consultation, flexible work hours, project space, student responsive goals, time for research and time to have fun. Sometimes it can be hard to fit creativity or fun into a busy day, a library run on hierarchies or a branch limited by funds. However I’m sure everyone out there is doing something, even if it’s small. Our section has played with Kindles, EcoBook and as of next week an iPad for ebook reading. Can you comment me what you’re doing? Sports tournaments (lawn bowling in the reserve room, miniature golf in the reference room, slalom book truck races in front of the library during intersession, shelving competitions in the book stacks). Dress-up-days (wonderful purple Wednesdays, library T-shirt day, “hat-o-ween” – rather than dressing in costume to celebrate Halloween, everyone wears a hat). Award ceremonies (Golden Shelf Award for the best example of returning books to the stacks in the shortest amount of time, Golden Mouse Award for outstanding contributions to computer customer service). Contests (“Messy desk contest”, judged by the “neat freaks” in the library, “Say the secret word” contest at the Circulation Desk where staff dress up in “Groucho” glasses and patrons win prizes for saying the “secret” word). Recreational activities (Friday afternoon concerts, or “sock hops”). Food-related events (“Chili cook-off competitions”, including an empty crock-pot for the “virtual” chili entry). Learn-at-lunch sessions (ballroom dancing lessons). and handily [for me] sets them in an academic library context. Outside of UTS playing with games days and QR codes I haven’t read a lot about allowing fun in the academic library space, and I’d love to have some research to back up suggestions for MPOW. Lawn bowling in the reserve room is fantastic, aisles already set up there! Some of us did a run at messiest desks online through our twitterstream this year, post @malbooth and @flexnib showing off their pristine cleared desks virtually. Ilene points out that “When we recognize the importance of humor, fun, teamwork, and camaraderie, we send a powerful message to our employees and patrons. We show that we value people, as well as the work” (p110). I think so many of our aims in the academic library world are focussed on preserving things, and whilst that is valuable in the end for some people, it would be good to bring some direct people focussed actions into our aims as well. 5pm: 1 good thing today: I got some things finished today and I still get to leave early! Very exciting. 11:30pm 1 good thing: Fabulous MTC play tonight. My face hurts from laughing. All the things I look for in theatre; strong women characters, brilliant one liners, timing, fabulous lush sets, clever words, flirting. Lack of a plot line barely noticeable. Go see “Boston Marriage”. I finally get a work iPad and it’s not for me. It’s to be used across our entire section. Still I had access to 1 so I was trying to be positive, and then laptop wouldn’t sync with iTunes store with wireless, and then once we fixed that (by which I mean the more patient @carolgauld fixed it) and had a happy time choosing apps, none of them would sync. NONE OF THEM! 1 thing I learnt: there is this great law called Hanlon’s Law that says “never describe as malice that which can be adequately ascribed to stupidity”. That has helped me when faced with many seemingly evil situations today! Hmmm. Perhaps that should be a little more specific. I need some helpful advice (yes I know this will largely exclude anything you had to say first off @malbooth) on what wonderful technology is out there that allows people to tune into the sound from tv screens with their own headphones. I know I could do a search on this, however I’m a digital era librarian and I figure I’ll call for help, then go investigate what you all tell me instead. Today, like many others I was trying to work out how to watch Julia’s first appearance on Question Time (so exciting). I was directed by @katclancy to the abc website streaming tv and got to watch it live. During this performance I realised that some of our library borrowers might want to see this too. We have new LCD screens in those branches that have been refurbished, and I went off to see how one goes about getting a site up there with short notice. I got some great help from our teaching spaces staff, however in the end the biggest problem turned out to be sound. For obvious reasons (ssssshhhhhh) we haven’t enabled sound on many lcd screens. Even if I was able to, the noise would mean it was hardly an “opt-in” experience, as should be preferable (for everything if any politicians are reading). One of the staff discovered an alternative source for me, however it’s got me thinking about using this in the future. so does anyone understand the technology that gives me audio to a screen through my own headphones? They do it at my gym using radio signals I think. I’m looking for an easy to buy product really ….